With rising global demand for fuel, energy, metals and minerals, there needs to be entities that can efficiently bridge the demand-supply gap. If you are one of those entities who can fill the void, Blue Mail Media’s Metallurgy Industry Mailing List can be your greatest resource. Our database gives you access to complete marketing information to help you efficiently carry out your multi-channel marketing campaigns. 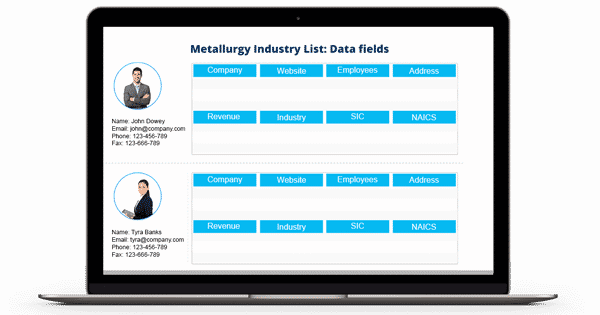 With our Metallurgy Industry Executives Email Database, you can reach out to your target audience via telephone, email or mail. Blue Mail Media has emerged as one of the highly recommended database vendor when it comes to implementing multi-channel marketing campaigns. We have been able to build a strong network of data partners which enables us to provide highly reliable data to different parts of the world such as the US, UK, Canada, North America, Europe, Russia, Africa, China, India, Australia, New Zealand amongst others. Our Metallurgy Industry Mailing Database has been prepared by our adept team of data specialists who put immense hardships into collecting data from reliable sources, verify data for accuracy and update the same on a constant basis to make sure our data remains qualitative at all times. Our clients can choose from our pre-packaged list of Metal Moulding Industry Executives or can get a customized list build based on their marketing specific objectives. Using our database, you are sure to achieve a greater response rate, conversions, and Return on Investments. Blue Mail Media gives you enough flexibility to either choose from our pre-packaged Metallurgy Industry Email List or get a customized list created as per your campaign specific requirements. With our data, you are sure to realize greater response rate, conversions and a healthy ROI.